Can you guess what is this object used for? Hint: we used it in the kitchen. 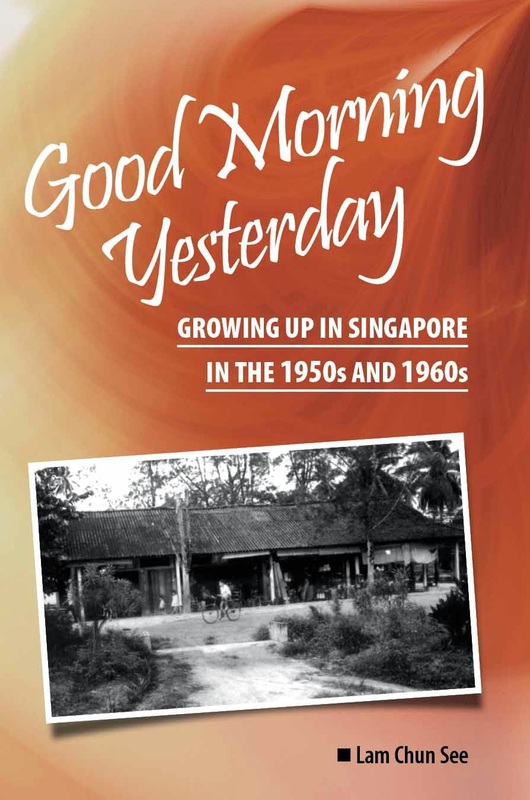 When I was a kid growing up in a kampong, I used to help my mother with chores in the kitchen; like pounding chilli, pounding fish meat for making fish cakes and fish balls, plucking chicken feathers and so on. One other task involved the above gadget. 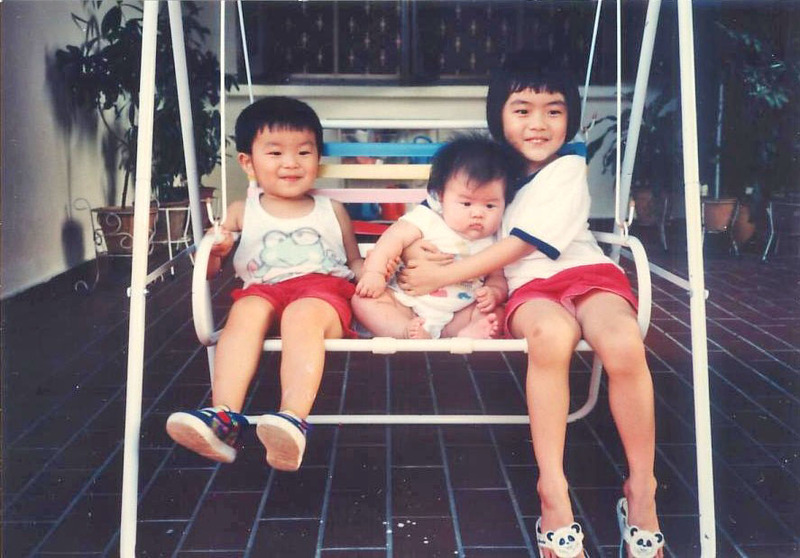 Here’s an old photo of my late mother and her sister taken in front of our house. Notice that there are lots of coconut trees in our kampong. Ok enough of distraction. Here’s the answer. Answer: It is a coconut grater. Nowadays the process of grating coconut is mostly done by machines and housewives simply bought the grated coconut or the coconut milk directly from the market. The equipment for grating the coconut was quite interesting. It was made up of a block of wood measuring about two to three feet in length. At the end of this block is fixed a small circular blade with serrated edge. To grate the coconut, you have to sit astride on the wooden block. Holding a half coconut, you run it repeatedly over the blade in a series of forward motions. The grated coconut would drop onto a pan below. In Cantonese we called this process, ‘pow yeh’. The above photo of a kampong-style coconut grater was taken by my friend YG Ong during a visit to Kuching, Sarawak. It is slightly different from the one we had in our house. For this one, the blade is mounted directly onto a bench whereas in our case, it was mounted on a block of wood. Much has been said of the Tanjong Pagar passenger hall terminal building at Keppel Road but little mention is spoken of the ancillary infrastructures and buildings which provided much of the support and maintenance services to the railway service. How big was the land-bank? 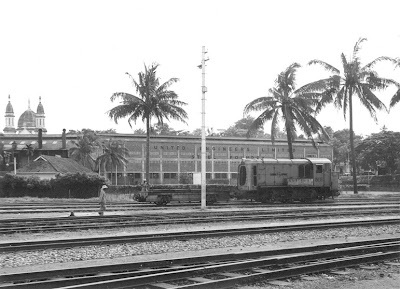 Photo 1-1: Kg Bharu railway-yard (c 1959). In the early 1960s I accompanied my mother to the St Theresa Church. Whilst my mother found quiet solitude in the church, I decided there was another better place for me at the Kg. Bharu road bridge. I watched the “chu-chu trains” come and go under the road-bridge. Some were very long, some very short in reference to the number of coaches or good-wagons pulled by a locomotive. 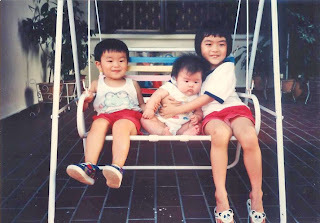 There were some occasions when my cousins and I walked from Eng Hoon Street in Tiong Bharu Estate to Kg. Bahru Road to see the trains. You could sense that I was the “Indian Chief” leading his braves on this adventure trip. 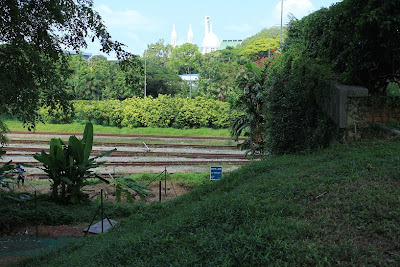 We took a short-cut through the football pitch of the Singapore General Hospital, near the Macalister Flats. I believe the football pitch has one-half still on the grounds of the hospital but the other half is now the CTE. 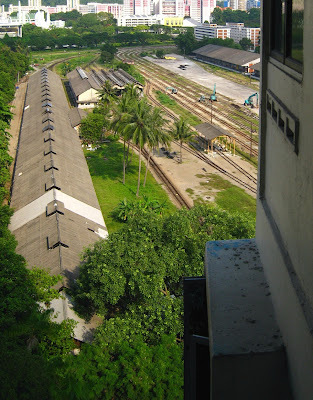 Photo 1-2: Kg Bharu railway-yard (c 2011). In those days, there was no such thing called “tight security” at the railway-yard. You walk into the railway-yard from several points; Blair Road, main Kg. Bharu Road (near a Chinese shrine and the B03 bus stop), Spooner Road or the laterite track on the side of Silat Walk. Photo 2: FMSR staff quarters. Near the Kg. Bharu road-bridge, still standing is now Block 23 at Silak Walk [top right corner]. Take note of the original site of the turn-table (c 1959). A reason for a clear-head memory on the exact spot where we slipped into the railway-yard in 1960 was because it was where I answered Nature’s call. Funny though how memories and history can repeat themselves even till today; on my July 2011 visit, I answered Nature’s call on the very same spot. Walking around the railway-yard we saw the locomotive/carriage sheds and several housing blocks. In the railway-yard, we found the coach livery painted in dual colours - the top was beige and bottom was brown - with the familiar “Harimau” (tiger) corporate logo of Malayan Railway. However we did not see workers working because it was past 5 pm. Some housing blocks looked neat with private gardens on the ground floor and tall chimneys. 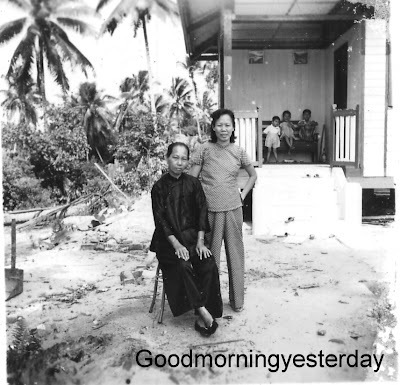 They were occupied by Malay families. Housing blocks nearer to Blair Road were occupied by male Indian collies. 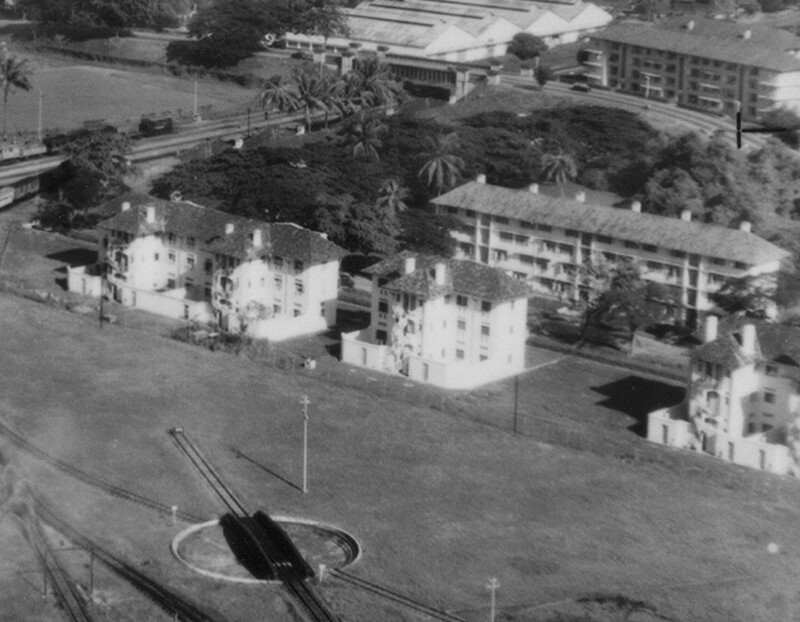 The Federated Malay States Railway (FMSR) management built the 2 and 3-storey housing blocks for the staff. Each building was unique because it had the name of the different states of Malaya. The buildings were later demolished around 1983. Replacing the housing blocks are now the empty concrete ground facing Godown # 2, Godown #2 facing Spooner Road, and the HDB-designed Blocks 1 & 2. Photo 3: The SLA signboard was where I pee in 1960; behind me would have been the FMS staff quarters. I pointed into a small drain which still exists. The former FMS staff quarters has given way to one side of the Kg. Bharu Road dual-carriageway, with the ground-level substantially raised. Photo 4: United Engineers Ltd Steel foundry with St. Theresa’s Church in the background (c 1959). Photo courtesy from the late Brian Raybould. The workshops and carriage/locomotive sheds at Kg. 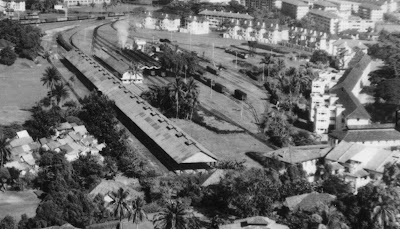 Bharu date back to 1932. So are the signal cabins, turn-table, a green coloured wooden house and the two red brick bungalows. 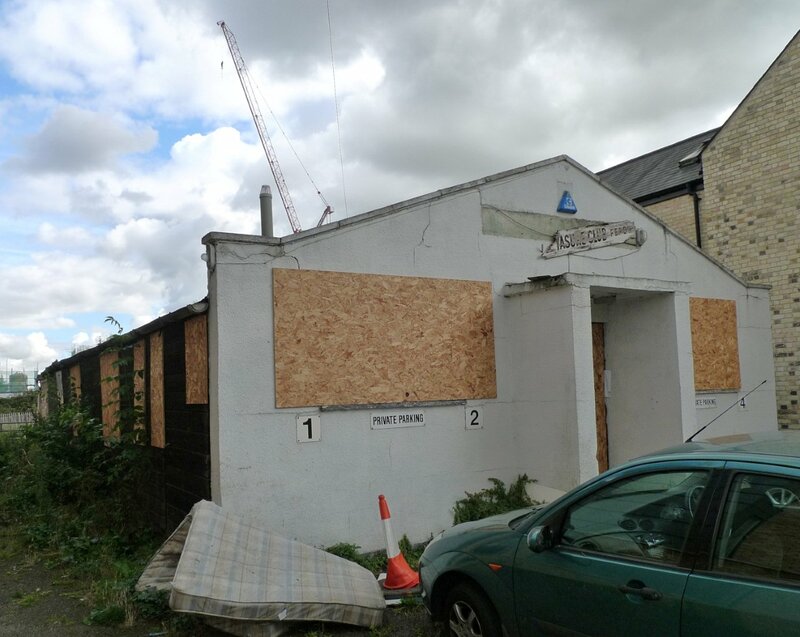 Will these buildings be retained to capture the aura of a former railway station? Will they have to go because the future concept plan calls for an optimum mix of prime office space and high-end hotel rooms that can synergise with the commercial, convention and hotel clusters at the future Tanjong Pagar waterfront? Cycling home last week here in Cambridge, UK, I took a road I don’t take too often and came to a halt as I passed this building. I have seen this hut before but had not realized that it was now boarded up, has been sold and will shortly be demolished. Rather surprisingly it had a Japanese name, ‘The Yasume Club’, ‘yasume’ means ‘rest’. You might also be surprised to learn that this old building in a side street in Cambridge has a great deal to do with Singapore. 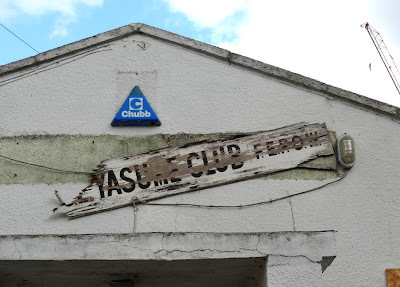 As the worn, lopsided, sign hanging over the door tells us, this hut belonged to FEPOW – Far East Prisoners of War. With the fall of Singapore in 1942, 50,000 British, Australian and other servicemen fell into Japanese hands. Most were eventually assembled at an army base at Changi. 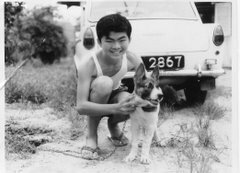 Lee Kuan Yew, then an 18 year old student at Raffles College, said ‘ I saw them tramping along the road in front of my house for three solid days’. Those prisoners suffered terrible hardship and 25% of them would die, sent from Changi across S E Asia and to Japan itself. Many died building the infamous Siam-Burma railway. Some who remained at Changi worked building an airfield at Changi. This became RAF Changi, where I lived in the early 1960s, and then part of the new Changi International airport and SAF base. On repatriation to the UK many of the former prisoners felt that their suffering was not and could not be understood. They formed their own clubs and associations and there were about 60 such associations which were part of FEPOW. Men from the Cambridgeshire regiment, who had fought in Malaya and Singapore where they became prisoners, opened their club house in 1952. 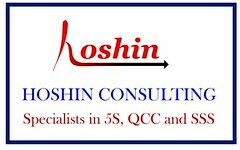 Finally, it closed in 2008 – its job, ‘To keep going the spirit that kept us going’, completed. Now the old hut in which those former prisoners met will shortly disappear and with it a small symbol of the linked histories of the UK and Singapore. Recently I attended a public concert by the Singapore Chinese Orchestra at Clementi Woods. One of the tunes they played was the well-known theme song from the Wong Fei Hung (Once Upon a Time in China）movies made popular by kungfu superstar Jet Li. The conductor did a neat trick by dividing the audience into two groups, and asking us to shout out at the precise moment; Ooh! and Aah! just like in the movie version made popular by George Lam. This classical piece incidentally is known as 将军令 or The General’s Command. I am sure the iconic intro of the drums and yangqin brings back nice warm memories for the oldies. Although the action sequences of the old black and white WFH movies are no match for today’s special-effects enhanced versions, it did not stop the kids of our era from having a good time then. Here’s a clip to rekindle your happy memories of those good old open-air theatre days. PS – Although I belong to what they call the hung-mao pai (红毛派 or English-Ed brigade) I do enjoy Chinese classical music. In fact I have a modest collection of 华乐 cds; including the ones containing 十面埋伏 and 将军令. Friends who want to borrow are welcome. If you came to my house you will be surprised to find this dirty old masking tape on one of the doors of my children’s rooms. About eleven years ago when we renovated our house, we gave the contractor strict instructions not to remove this masking tape. Do you know why? It’s a visual record of the heights of my children as they grew up in our house. In the twinkling of an eye they are all grown up. Last night, I sent my youngest off to the UK for further studies. At the same time, my son who completed his NS last year has also started his classes in NUS. Soon the nest will be empty. But the masking tape will remain. I am at a loss as to how many computer-related fairs there are in a year because unlike many others I have never made an annual pilgrimage. 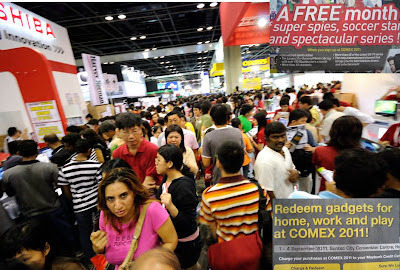 The first occasion was in 2006 and the next time was to a computer show at SUNTEC City in 2010. On both occasions, it was blogger Victor Koo who encouraged me to make the trip for the best mega-deals in town. Photo 1: A computer show at SUNTEC City. From both fairs, I got the impression times have changed. Now it looks more like a bazaar rather than an exhibition or a trade fair. Today there’s a gamut of product-offerings at such as cameras, camcorders, printers, mobile phones, TVs & home entertainment, games, monitors and accessories. The crowd profile looks different - casual in dressing and more female visitors. So why am I blogging about it? Well the computer fairs or exhibitions do have a heritage touch to it. Do you know when was the first ever computer show held in Singapore? Where was it held? Photo 2: Hyatt Hotel (c 1981). 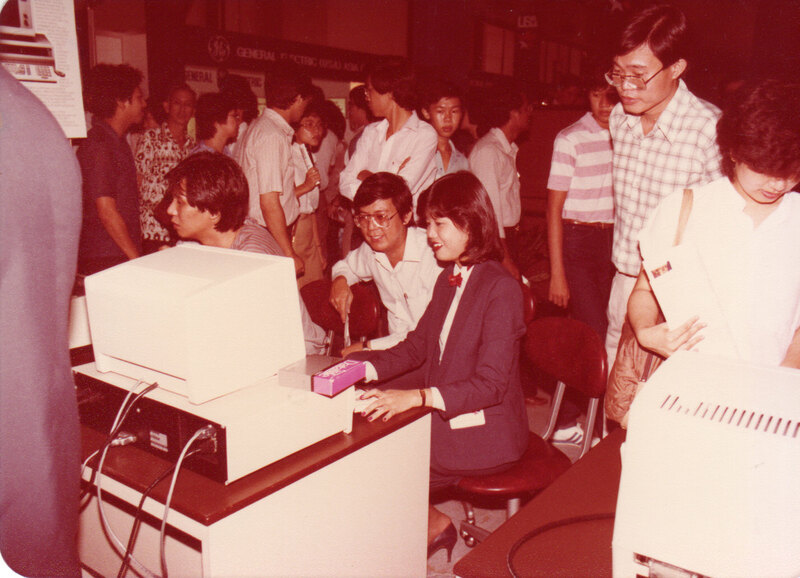 When computer shows were first introduced into Singapore, it was led by the PCs. You never found Mainframes, Mini-computers or Workstations in any exhibition until the National Computer Board (NCB) was formed in 1984. This means that big IT vendors such as IBM, Unisys, NCR, HP, Sun Microsystems or Digital actively took part in shows after the Singapore Government’s computerization program swung into high gear. 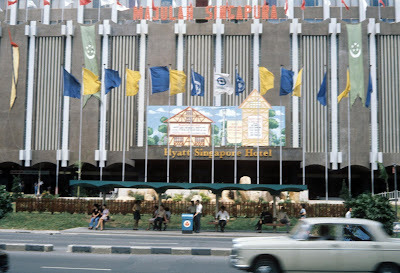 Similar to “rapid urban renewal” in Singapore, NCB disappeared in the late 1990s after it merged with the Telecommunication Authority of Singapore (TAS) to form IDA. 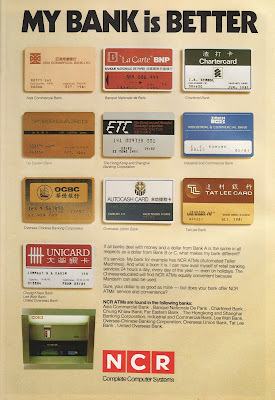 Photo 3: NCR advertisement(c 1983). The first PC Show was held at the Hyatt Hotel in 1982. Here are some old snap shots of that show. It was called PerCompAsia 1982. 1982 was a significant year because IBM launched the IBM PC/XT models; minimum configuration was 32K Ram, 2 X 5.25” floppy drives of 360KB each and a higher capacity model which had a 10MB Tandon drive. How many of you can remember home entertainment ATARI or PET COMMODORE? How about the Philips word processing systems? Photo 4: Big dinosaur PCs. A marketing support personnel explaining to an illiterate IT customer (c 1982). Yesterday’s PercompAsia 1982 was organised by Singapore Exhibition Services Pte Ltd. The exhibition was quite unlike today’s modern “pasar malam” because the organizers did not allowed for on-the-spot sales. 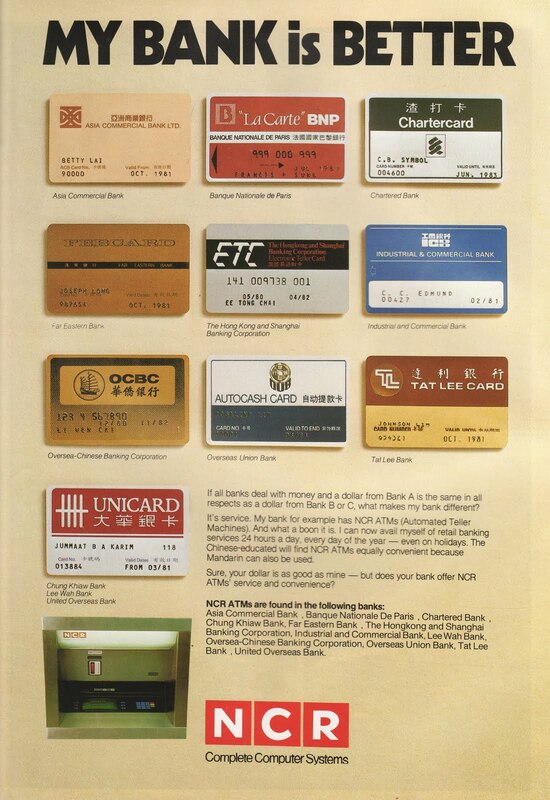 Just to give you a sense of how much Singapore computer users have come from 20 years ago, the software demonstrated included personal productivity tools - SuperCal, Wordstar and Dbase II and accounting - General Ledger, Accounts Payable and Accounts Receivable. 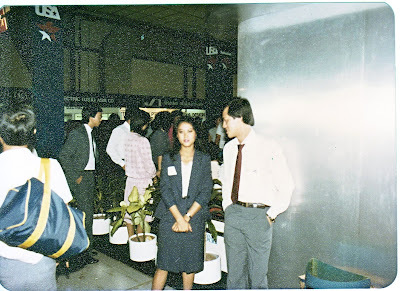 When I looked back at these old photos, there is a certain smartness and uniformity of these IT personnel. They wore the familiar business suites or normal office attires of dark trousers and white shirt, and spoke proper English (not Mandarin with some English words thrown in). In fact I heard many stories which echoed the same voice: The day Yaohan Best sold computers, it was time to get out working in the IT Industry. Good bye to bits and bytes!